(Quick note from Cassity) I know I usually have a recipe for today, but I asked Madaline if she would make us a cooking conversion chart printable. I have seen some great ideas for organizing lately, and one of my favorites was a vinyl measuring chart by Beckie for the inside of a cupboard… but the truth is, I just don’t have the time to do all the work. And for some reason I have a mental block as to exactly how many Tbsp are in a 1/4 cup (4 by the way…) I think it is because there are only 3 tsp in a Tbsp… and I think it should be the same, oh well, our measuring system makes no sense. Which is why this little printable is so fabulous… because I do have time to print out a cute printable to put on the inside of my cabinet doors. Happy New Year Remodelaholic-ers! It’s Madaline again from the blog “designer. wife. regular person.”, and the designer/creator of Paper Clouds! I hope you guys will stop by and check out my shop, I’ve got some fabulous new products listed and have a ton of new things to list! Isn’t there something so amazing about a brand new year? We all need that fresh new start, a new year, a new diet, a new plan, new goals. All of it. And I don’t know about you but I’m in CLEAN FREAK mode! I’ve been cleaning out drawers and cabinets…oh…and my office…don’t even get me STARTED ON THAT! It’s a disaster, but I’ve got big plans for clean freak mode in there! Anyways, we thought this months printable would be perfect for all you fabulous readers that are getting everything back into place, and a Cooking Conversion Chart seems perfect for those extra organized extra clean cabinets! To download the file just click the arrow on the right side, or you can print straight from the box! I hope you guys have a fantastic new year and don’t forget to stop by the shop! See you in a few weeks for some more awesome goodies! Recipe Link Up Time! What have you been cooking? Thanks for hosting this recipe swap each week! Perfect timing with the conversion chart! I was just going to look them up- thanks a million! This is so cute and matches my kitchen perfectly. Will look like art framed on the wall! I am so glad! Send me a picture if you get it framed! I would love to see it! 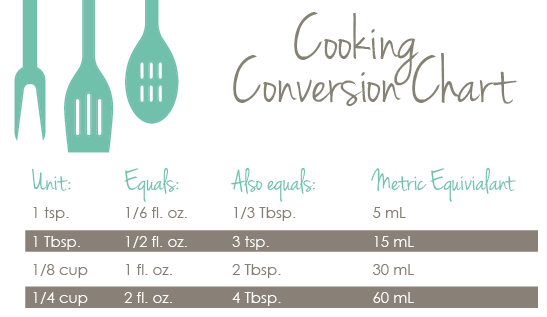 I definitely need this conversion chart hanging in my kitchen! Thanks for sharing! love this chart! Thanks for linking up to the Tuesday Talent Show! I hope to see you again next Tuesday! Hi! Thanks for this printable. I’m always looking it up online and decided I needed something I could post in my kitchen. This is a big help! I am so glad I thought it would be helpful, I am glad that it is useful!